Though income tax rates have been lowered for residents, North Carolina collision repairers could soon encounter sales tax sticker shock from out-of-pocket customers — not to mention insurers with corporate offices out of the state. Starting March 1, 2016, the state’s 4.75 percent sales tax will be applied to services related to the maintenance, repair or installation of “tangible personal property or a motor vehicle,” under the House Bill 97 budget legislation. The $21.74 billion budget bill was signed Sept. 18 by Republican Gov. Pat McCrory. The Raleigh News & Observer reported Sept. 19 that income taxes would be cut $400 million to offset this. As of April 2015, most North Carolina counties added another 2 percent sales tax on top, for a combined 6.75 sales and services tax rate. The most recent Mitchell data estimated the price of the average collision repair at $2,884 in the second quarter of this year. At a 6.75 sales tax rate without any exemptions, that’s an extra $194.67. More answers on how it’ll apply for businesses should be coming shortly. 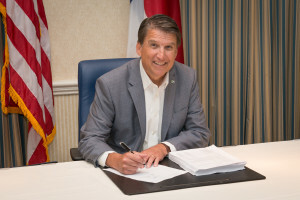 Trevor Johnson, spokesman for the North Carolina Department of Revenue, said a general “heads-up” should be released about next week to the business community regarding the new law. That will be followed by a set of industry-specific guidelines. Johnson said the agency hopes to release the latter no later than Jan. 1, 2016, given the March 1, 2016, start date for the tax. The News & Observer, citing legislative projections, reported North Carolinans making less than $30,000 a year would only see income taxes fall at most about $50 from a prior tax bill that was at most $500. Households with combined incomes of more than $95,000 would on average see taxes fall $476, the newspaper reported.